"I met somebody… An Italian fella. We're going to Coney Island on the weekend." This looks charming. Fox Searchlight has debuted the first trailer for John Crowley's Brooklyn, starring Saoirse Ronan, a vintage romance set in New York City in the 1950s. The cast includes Domhnall Gleeson, Michael Zegen and Emory Cohen, but this is really Ronan's show. As a young Irish immigrant, she struggles to find her place in America, but then falls into a relationship with an Italian boy. This trailer really builds into magnificence at the end, with a lovely score and some fantastic shots of the city. But it's the shots of Saoirse Ronan pining, and crying, and longing, that will really hit you deep in the heart. First premiered at Sundance in January. Brooklyn tells the profoundly moving story of Eilis Lacey (Ronan), a young Irish immigrant navigating her way through 1950s Brooklyn. Lured by the promise of America, Eilis departs Ireland and the comfort of her mother’s home for the shores of New York City. The initial shackles of homesickness quickly diminish as a fresh romance sweeps Eilis into the intoxicating charm of love. But soon, her new vivacity is disrupted by her past, and she must choose between two countries and the lives that exist within. Brooklyn is directed by John Crowley, of Closed Circuit and Boy A previously. The screenplay is written by Nick Hornby, based on Colm Tóibín's novel. 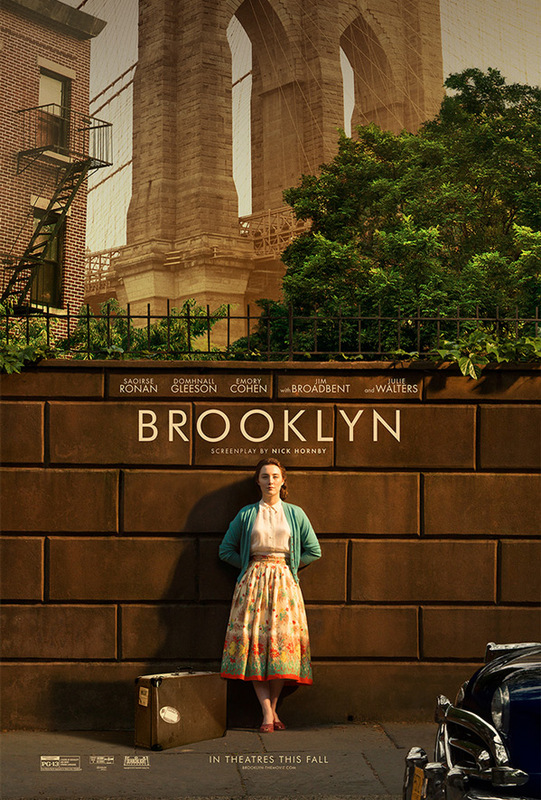 Fox Searchlight will open Brooklyn in select theaters starting November 6th this fall. Saoirse Ronan is extraordinarily pretty. She is one of my film crushes, no doubt. Its an odd attraction but I agree. She isn't the type you notice first, but the type whose beauty goes beyond that first look. And then you keep coming back for more because its something you can't understand but feel. Appreciate the honest response. Actually more than anything I was curious what other people would think of this? I haven't seen it, but many of my friends have been raving about it. Looks pretty good. Boring but good. I hope they depict Brooklyn like I always hear it was back then. A dangerous place of thugs and thieves. Can't help but being drawn to this movie. Should be a welcome palate cleanser after a summer of empty-calorie eye candy. Not to mention that outstanding poster. Huh. I was wondering where she (Ronan) went.